Drawing Dry Pastels on 100% Acid Free Reg Paper | 14" x 21"
Painting Acrylic on Canvas | 16" x 16"
Drawing Charcoal on 100% Acid Free Reg Paper | 6.42" x 29"
I have come across deep meaning in the rural theme. Through the isolation and seclusion of rural life, what stands out to me are their concepts of creation, potential, connection, preservation and privacy. I am highly motivated by these discoveries as well as the challenge of the medium I use. In my charcoal drawings, I attempt to create and show intimacy through subjective portraits of rural folk, while letting my viewers unravel the story that each character has to tell. Ramesh Pachpande displayed artistic talent at an early age and went on to graduate from J J School of Arts with a Diploma in Art Education. Primarily focusing on the human form, Pachpande paints in realistic style, highlighting facial expressions and bringing to the fore, the intimacy of human couples with musical expressions. He works with charcoal and acrylic on canvas or paper, as he feels it perfectly complements stark human relationships. His paintings reflect his rural roots, portraying the charm and purity of rural folk. 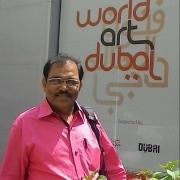 Ramesh has been awarded especially for his Indian style and charcoal work and he has exhibited his work at several solo and group shows in India and across the world.